The aim of this study was to determine whether or not promoter polymorphisms of the class I major histocompatibility complex (HLA-E, HLA-F, and HLA-G) are associated with susceptibility to vitiligo. 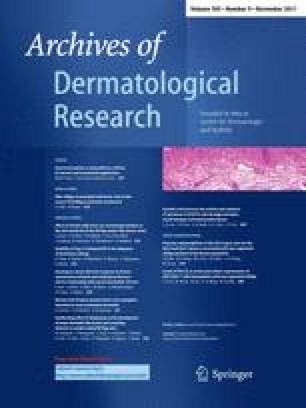 To identify a possible association with vitiligo, 241 patients with non-segmental vitiligo (NSV) and 395 healthy controls were recruited in this study. Three promoter single nucleotide polymorphisms (SNPs; rs1264459 of HLA-E, rs9258170 of HLA-F, and rs1736936 of HLA-G) were analyzed using a polymerase chain reaction-restriction fragment length polymorphism (PCR-RFLP) technique and direct sequencing. Multiple logistic regression models (co-dominant 1, co-dominant 2, dominant, recessive, and log-additive models) were applied for odds ratios (ORs), 95% confidence intervals (CIs), and P values. To obtain the defined results, P values were recalculated by a Bonferroni correction. After the Bonferroni correction, the genotype of the SNP (rs1736936) of HLA-G was shown to have significant association with NSV (P = 0.045 in the recessive model). The genotype frequencies of the HLA-G SNP (rs1736936) had a significant correlation with the age of onset of NSV (P = 0.016 in the co-dominant 1 model and P = 0.027 in the dominant model). Our results suggest that HLA-G, but not HLA-E and HLA-F, may be associated with susceptibility to NSV in the Korean population. S. K. Kim and M. S. Hong contributed equally to this work.